The atmosphere is comfortable and relaxed and the décor is predominantly stripped wood floors and ceilings with ultra-comfy black leather and wooden seats with unequalled views of the historic buildings of Westminster. Rock the boat provides a perfect canvas for any reception, cocktail party, and product launches for a maximum of 200 people. From this versatile space, visitors can enjoy undeniably the most breathtaking views of London. In the good weather you can sit on the top deck and enjoy a cocktail or two. 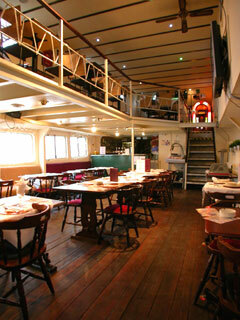 With a maximum capacity of 200, Rock The Boat offers a number of flexible options; open top deck, stern cocktail deck, mezzanine gallery or the main saloon. She is also available for exclusive hire. You can choose from the Breakfast or Main Menu depending on what time you are dinning. There�s also a bar snack and light bite's menu to nibble at before your meal arrives or to enjoy when drinking. Please note that the menu is subject to change.